Ever since ancient times, salt has been a valuable ingredient for everyday life. From food preservation to food enhancer, it was even used as currency to trade amongst earlier civilizations. Salt varieties are bountiful these days. Just take a look at your local grocery store. There are so many d-lish options to choose from fleur de sel (a French sea salt) to hickory smoked flavored and even cabernet red wine salt – so yummy on a steak! Salt just pops the flavor of any dish. Chicken, grilled fish, roasted veggies…and even cocktails! Just remember, a little bit goes a long way. 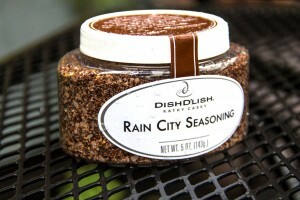 We have a great new salt in our Dish D’Lish line up: Rain City Seasoning – inspired by Seattle’s coffee addiction. It’s a blend of Caffè Umbria Coffee Roasters coffee and Theo Chocolate cocoa nibs with two types of salt, dried orange peel, allspice, and other spices to deliver a versatile and d’lish seasoning! Rain City Seasoning is perfect on salmon or steaks or sprinkled on roasted root vegetables. And it’s D’lish as a Bloody Mary rimmer. Toss together then spread on a sheet pan. Let sit out for about a week uncovered in a cool dry place – mixing daily. 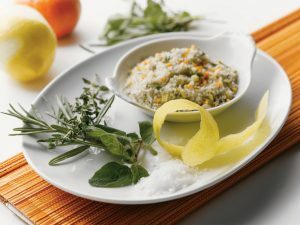 Once the lemon and herbs dried, place in a food processor and whiz it up – or go old school and use a mortar and pestle. 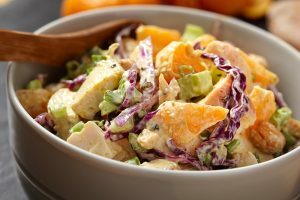 You can also add in orange zest, or lime zest too to switch it up! Or double the amount of zest and herbs for extra flavor. Holiday party planning in the works? Need some cocktails for a crowd? I’m here to help with some great drink ideas, so you won’t have to be tied to the bar and have lots of time to be merry with your guests. It’s all about “pre-batching” and planning. First, write up your cocktail/beverage menu. Pick 1-2 signature cocktail recipes and supplement with red wine and champagne. Be sure to have something festive for the designated drivers as well. Who’s ready for my Festive Sparkling Rum Punch? How about a Festive Sparkling Rum Punch – made with rum, brandy, fresh juices, and homemade spiced syrup. You can make this up to a week in advance and refrigerate. 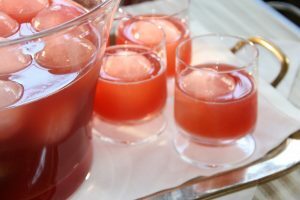 Then, whip out that punch bowl from the closet and serve over a fun ice ring and finish it with champagne. Yum! For the non-imbiber, my Rosemary POM Holiday Sparkle is a cheery combination of fresh rosemary, tangerines, pomegranate juice and sparkling apple cider. Finish off the evening with a batch of my Hot Buttered Eggnog Mix. The secret ingredient… is vanilla ice cream! Just add rum and hot water. Great to sip on while sharing stories around the fireplace. Combining two holiday favorites! Add more or less to taste; rum and Spiced Eggnog Mix. 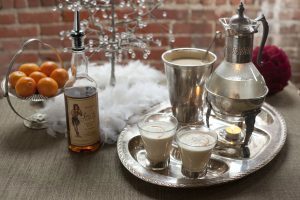 Place Eggnog Buttered Brandy Mix and rum in coffee glass or mug. Stir in boiling water until batter is dissolved. Grate fresh nutmeg over the top. Garnish with orange zest. Be sure butter is softened. With an electric mixer; cream butter, orange zest and sugars together in a mixing bowl until totally smooth. 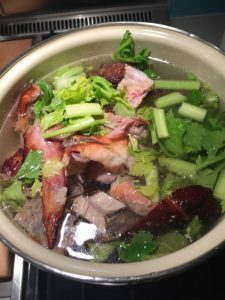 Add remaining ingredients and mix until thoroughly combined. Store refrigerated for up to 1 week, or frozen for up to 1 month. The holidays are right around the corner! And I have a few d’lish ideas for your favorite foodie. Try making a local themed basket filled with handcrafted NW goods! First a Sweet Basket: local chocolate bars, honey, salted caramel and unique preserves, and cute little spoons to serve them up with. Don’t forget to tuck in one of my “Over 21” Real Fruit Cakes made with Maker’s Mark – bourbon-soaked fruits and toasted nuts bound in a spice batter and topped with a brown sugar-bourbon glaze – yowza! 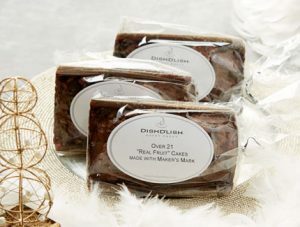 A great basket or stocking stuffer – my “Over 21” Real Fruit Cakes made with Maker’s Mark! Next a Savory basket: local cheeses, cool pickles from the market, herbed flat bread, and dried fruits, add some fun cheese identification markers and a cool little wooden cutting board and it’ll be a hit! For a Boozy Basket: package up a bottle of local spirit like one of our Washington herbaceous gins or Glass Honey Vodka (one of my faves), tuck in a couple of cool cocktail glasses, and a bottle of unique local bitters. For more inspiration, make sure to check out KnackShops.com a local based custom gift side for even more creative basket ideas.